The Federal Ministry of Education in Nigeria oversees policies, regulations among other things in the education sector as you must have read in the introductory post titled “Things to know about Nigeria’s Federal Ministry of Education”. It has fifteen various departments that ensure that its services are delivered to Nigerians in general. These departments along with parastatals and units under the ministry make the work of the Minister of Education effective. In this post, EduCeleb.com presents you the names of the departments, their services and locations. Note that except otherwise stated, the following Departments are located at the New Federal Secretariat Phase 111, Shehu Shagari Way. P.M.B. 146 Garki, Abuja. So, the next time you have something to do with the ministry, familiarity with these existing departments would be of help. The Department of Basic and Secondary is located on the 6th floor of the Ministry’s building and has seven divisions which are headed by Deputy Directors. There are 21 branches in the Department and each branch is headed by an Assistant Director. The main function of the Department is to provide enabling structures and build capacity for efficient and effective implementation, monitoring and evaluation of the National Policy on Education (NPE) on Basic and Secondary Education. (i) Periodic monitoring and evaluation of welfare of staff and students of Federal Unity Colleges (FUCs). (ii) Assessment of the quality of leadership exhibited by the principals of FUCs. (iii) Assessment of the school plant i.e. landscaping of the school, is the school environment learning friendly? Is the library well stocked? Perimeter fencing of the school compound etc. (iv) Promotion of multilingual education at the Basic and Secondary levels. (v) Supervision of FUCs to serve as vehicles for National cohesion and models for states and private secondary schools. (vi) Monitoring of the implementation of the national strategy for inclusive education to ensure equal access. (vii) Promoting universal access, equitable and qualitative Basic and Secondary Education. (viii) Facilitating a conducive environment for staff for teaching and learning. (ix) Provide best practices for the teachers at the Basic and Secondary levels of education. (x) Monitoring and evaluation of the implementation of the NPE, Universal Basic Education (UBE) Act and the National Council on Education (NCE) decisions. (xi) Ensuring teachers’ welfare, motivation and other school support services. (xii) Monitoring of the implementation of the National Strategy for inclusive education to ensure equal access to education of children with special needs. The Department of Tertiary Education is located on the 7th floor. It has the statutory responsibility for the formulation, implementation and monitoring of policies on Tertiary Education for matters affecting Universities, Polytechnics and Colleges of Education in Nigeria. This extends to the Authentication of Certificates and Accreditation of local and foreign qualifications in Education. (xi) Provision of advisory and appellate services to States and private institutions. (xii) Annual Global Teachers Day Ceremony, Integration of Teachers. Federal Education Quality Assurance Services department was created under Decree 16 (now Act 16) of 1985. It is vested with the responsibility of the establishment and maintenance of Minimum Standards in pre-primary, primary and post-primary (Basic and Secondary) schools and similar institutions in the Federation on the Minister of Education which he executes through the Federal Education Quality Assurance Services. Quality in Education Delivery is assured through external evaluation and school self-evaluation of overall performance and effectiveness of schools. It is located on the 9th Floor. (ii) Collaborate with relevant agencies to evaluate the quality of instructional materials and their appropriateness. (iii) Ensure attainment of minimum and uniform standards in educational practices nationwide through compliance with National Policy on Education. (iv) Undertake regular capacity building for inspectors. (vi) Review regular existing guidelines for school inspection. (vii) Serve as approving agent for school requiring registration for National Examination. (viii) Develop the guidelines for participatory inspection. (ix) Ensure schools accountability to government and community. (xi) Under take advocacy and sensitization of stakeholders on the implementation of recommendations from inspection reports. (xii) Provide guide lines on the establishment and accreditation of schools. (xiii) Develop a code of conduct for inspectors and ensure compliance. 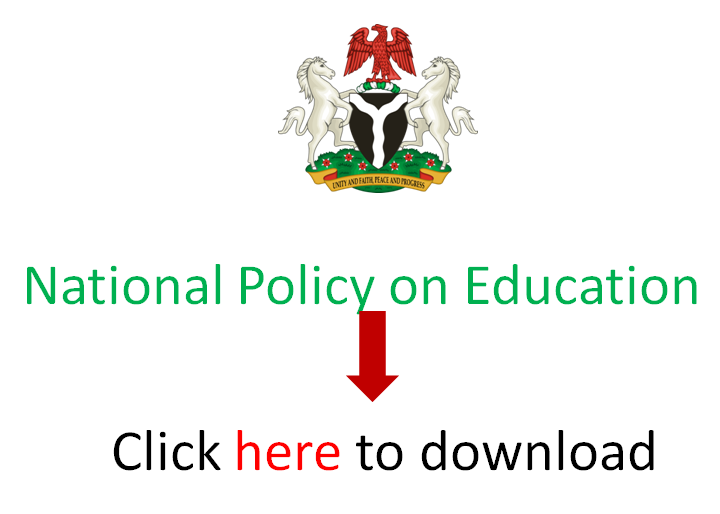 (xiv) Publish “Annual State of Education in Nigeria” of institutions below tertiary level. (xv) Develop a data bank in the inspectorate services. (xvi) Disseminate information on inspectorate service, through the production of periodic publications, such as journals and Newsletters. (xvii) Monitoring of all school examinations. Located on the 5th floor, the department is responsible for the Coordination and Development of Education policies, strategic and medium sector and action plans, research, documentation and harnessing of national and international partnerships for efficient and effective Education Service Delivery. (i) Develop, update and maintain computerized database for all levels and types of Education Institutions. (ii) Conduct surveys of all types for different indicators and publish reports thereof. (iii) Develop and maintain a specialized library and supervise all school libraries below the tertiary level of education. (iv) Evaluate and continually update curriculum for different levels of education. (v) Collect and consolidate information and statistics response to questionnaires and queries from other agencies. (vi) Compile lists of educational institutions; public brochures and monographs on educational systems. (vii) Undertake research for the formulation of education policy, planning and other programs. (viii) Organize workshops, seminars and meetings on issues related to educational problems and development. (ix) Coordinate the articulation of the FME Strategic and Sectoral 10-year plans and MTSS and the monitoring evaluation of plan performance. (x) Co-ordinate partnerships with national and international organizations working in the fields of education planning, management and research. (xi) Coordinate the secretariat for the main two organs for National Education Policy development – the Joint Consultative Committee on Education (JCCE) and the NCE. (xii) Coordinate the implementation of MDG projects by beneficiaries in the Education Sector, and monitoring and evaluation of these projects. (xiii) Coordinate the Exam Ethics and Campus Safety activities of the FME as it affects all levels of Education in Nigeria. (xiv) Create synergy with the National Institute of Educational Planning and Administration (NIEPA), the National Educational Research and Development Council (NERDC) and the National Library and monitor target attainment of their development and medium term plan. Finance and Accounts department is one of the professional Service Departments that assist the Federal Ministry of Education in Nigeria through provision of financial services, budgetary services and rendition of financial and accounting returns in line with the Financial Regulation and extant rules. The Finance and Accounts Department assists the Permanent Secretary of the Ministry to render accounts of his stewardship to government through submission of monthly transcripts and financial returns to the Office of the Accountant-General of the Federation. The department is located on the 2nd Floor. (i) Payment and settlement of staff and contractual claims. (ii) Collection of independent revenue for government. (iii) Verification and inspection of accounts books and documents of FUCs and FIS offices. (iv) Training and retraining of accounts staff both in the Headquarters, FUCs and FIS offices. (v) Provision of answers and replies to question from PAC and Federal Auditors. (vi) Issuance of treasury receipt to the public for revenue received. (vii) Issuance of AIE to FUCs and FIS offices. (viii) Liaising with National Assembly, the OAGF, the Office of the Head of Civil Service of the Federation (OHCSF), the Central Bank of Nigeria (CBN), and other Agencies on behalf of the Ministry. Human Resource Management department is charged with the responsibility of employing persons to posts on grade levels 01-06, training, discipline and promotion of serving Officers as well as processing of pension benefits. The department is located on the 3rd floor in the ministry headquarters. (vi) Processing of pension benefits. The Information and Communication Technology (ICT) department was established in 2007 specifically to drive the delivery of innovative technology solutions and support services towards ensuring that all departments within the FME are able to leverage modern ICT resources to optimize their respective functions. In the year 2011, a new ICT Department was created to serve as an ICT co-ordination resource for the education sector at large, ensuring development of uniform standards, skills, acquisition and using a convergence-driven approach to eliminate duplicitous expenditure. The office is on the 4th floor. (i) Staff Capacity building in the usage of ICT. (ii) ICT staff professional skills. The Technology and Science Education department is mandated to formulate and implement policy on technology and science education. (i) Vocational (job specification) education offered in Technical Colleges and Vocational Training Centres nationwide. (ii) Pre-vocational education offered in primary and secondary schools nationwide. (iii) Science education offered in primary and secondary schools. (iv) Technology teacher education offered in the Universities, Colleges of Education and Polytechnics. (v) Vocational education quality control and assurance nationwide involving national curriculum development and programmes accreditation. (vii) Related distance education in technology and science education curriculum. The Public Procurement Department is located on the 3rd floor in the ministry. It is the Public Procurement Act 2007 that established the procurement department and charged with the responsibility to amongst others, provide legal and institutional framework and professional capacity for Ministry’s procurement. (i) Follow the general policies and guidelines relating to public sector procurement for the approval of the Ministerial Tenders Board. (ii) Ensuring adherence to thresholds as may be set by the Council of Bureau of Public Procurement. (vii) Maintain a database of the particulars and classification and categorization of procurement activities in the Department. (xi) Prevent fraudulent procurement and where necessary apply administrative sanctions according to the act. The Legal Unit of the Federal Ministry of Education is an extension of the Chambers of the Honourable Attorney-General of the Federation and Minister of Justice who is the Chief Law Officer of the Federation, by virtue of section 150 and 174 of the 1999 Constitution. Located on the 4th floor, it is headed by the Legal Adviser who is assisted by other lawyers posted from the Federal Ministry of Justice. The following are some of the services the department provides. (i) Rendering legal advice/opinion on any matter with legal connotation referred to the Unit from the Ministry and its parastatals. (ii) Preparation of bills for amendments of laws or for enactment of new laws. (iii) Preparing and vetting legal instruments i.e. Deeds of guarantee, Powers of Attorney, Education Law Instruments, searches, investigations and perfection of Legal Titles and liaison with regulatory authorities on legal issues concerning the Ministry. (iv) Participating in negotiations, preparing and vetting of Contract Agreement/ Memorandum of Understanding (MOU) and other legal documents involving the Ministry. (v) Representing the Ministry at local and international meetings, seminars and workshops. (vi) Attendance at Board or Committee meetings such as Ministerial Tenders Board (MTB) and other ad-hoc Committees. (vii) Liaison with the Federal Ministry of Justice on behalf of the Ministry and Parastatals on legal issues. (v) National Project Coordinating Unit (NPCU). (i) Policy design, coordinating and implementation of programmes of international cooperation in education. (ii) Promotion of art and cultural education. (iii) Book development in the country. (v) Evaluation of foreign qualifications and accreditation of foreign institutions. (vi) Language development promotion of health and sports education. (vii) Coordination and implementing HIV/AIDS intervention policies in education sector. (viii) Registration and monitoring of Non-Government Organizations in education sector. (ix) Coordination and supervision of World Bank – Assisted UBEP II National Project. Providing leadership and support for quality instructional programs. The Reform Coordination and Service Improvement Department was established by Circular No. HCSF/CME/EM/234/17 of 11th March, 2014 with the mandate to coordinate, drive, monitor and report on the implementation of the Reform Agenda in MDAs. The main focus of the Department is to identify lapses in work processes, systems and service gaps and with the Bureau of Public Service Reforms and Office of the Head of Service, develop interventions to eliminate such gaps. The following functions are performed by these divisions. (i) Serves as the focal point for driving all change, reforms, innovation and improvement efforts within the Ministry. (ii) Liase with the Ministry’s Departments and the office of the Head of Service to develop, refine, improve and recommend more efficient work processes and systems for the Ministry. (iii) Develop and deploy change management tools and practices to institute sustainable improvement in the Ministry. (iv) Identify and research into good services with a view to adopting the best options for possible adaptations to Service Delivery in the Ministry. (v) Check the levels of implementation of Government Circulars to what is obtainable in the Ministry with a view to ensuring that such circulars are constantly implemented. (i) Spearhead the Ministry’s (including extra-ministerial Departments and Parastatals) Service Delivery initiative through SERVICOM Compliance. (ii) Manage the Ministry’s customer relation Policy including providing opportunities for customers’ feedback on services. (iii) Disseminate best practices and other tips on service delivery improvement. (iv) Initiate Sensitization Programmes on the Principles, Aims and Tenets of SERVICOM for Staff of the Ministry, Parastatals, Institutions and even students to achieve attitudinal change. (v) Develop, update and publish the Ministry’s Service Delivery Charter with a view to creating the necessary awareness of the expectations, rights and obligations of the Customer. (vi) Institute a complaint procedure and grievance Redress Mechanism for the Ministry. (i) Responsible for enlightening and educating the staff of the Ministry against corrupt practices. (ii) Carry out preliminary investigation on all petitions sent to the Ministry on corrupt practices and report same to Management, ICPC, EFCC and Office of the Civil Service of the Federation as the case may be. (iii) Carry out studies of all operational systems and procedure in the Ministry and make recommendations and amendment. The Internal Audit Department is mandated to ensure prudence in the management of the resources of the Federal Ministry of Education. The department does the following. (i) Pre-auditing of payment of vouchers. (ii) Post Auditing of Accounting records maintained by the Ministry, Unity Colleges, inspectorate offices, Federal Scholarship Board and other areas of activities and functions of the Ministry. (iii) Prompt cash survey and verification of cash and assets quarterly. (iv) Auditing the System of Revenue Collection and actual revenue collected monthly. (v) Routing auditing of expenditure daily. (vi) Auditing of issuance and consumption of stores monthly. (vii) Verification of stores and plants held by the Ministry quarterly. (viii) Ensuring that accounting records are accurate monthly, quarterly and annually. (x) Investigation when the need arises. The Federal Ministry of Education Headquarter Library Department is charged with the provision of information for education research planning and recreation, for effective and efficient service delivery. Indeed, the library provides access to all kinds of materials which contain credible and substantial information required for good governance, national growth and development especially on education matters. These services are provided through the department. (i) Selection, acquisition and organization of books, journals, government publications and library materials, based on an approved library policy and classification scheme. (ii) Provision of library services (digital and/or analog); provision of reference and current awareness services. (iii) Regular building of human capacity of library stocks. (iv) Promoting readers awareness and library promotion campaign. (v) Coordinating of the administrative and professional activities of library services in relationship with professional bodies and library associations (IFLA, LRCN, NLA, and AGOL. (vi) Selective dissemination of information in line with the vision and mission of the parent ministry. Federal Scholarship Board is saddled with the responsibility of organizing various scholarship programs and assisting the brilliant, but indigent Nigerian youths to achieve their dreams for higher education within and outside the shores of Nigeria. Its office is located on the 2nd floor of the FME Annex, Opposite Arewa Suites, Central Business Areas. Formulating and Implementing Federal Government policies and programmes on foreign and local scholarship awards to deserving Nigerian scholars. (i) Preparing and organizing various scholarship programmes (Nigerian awards, Bilateral Educational Awards, Commonwealth Scholarship and Fellowship plans and other international Aid programmes. (ii) Organizing qualifying interviews for the award of scholarship to study in Nigerian tertiary institutions, the Bilateral and multilateral awards. (iii) Processing the remittances of scholars’ allowance to scholarship accounts in foreign countries. (iv) Advising and coordinating state scholarship policies and programmes through the Annual Coordinating Committee Meeting (CCM) of Secretaries and Federal and State Scholarship boards. (vi) Liaising with tertiary institutions and foreign missions and scholarship awards, visas and the welfare of scholars. (vii) Publicizing other scholarship information to interested members of the public.